Add 4 cups water, cider vinegar, thyme, garlic, bay leaves, peppercorn and salt to a medium saucepan set over medium heat. Bring to a simmer. Simmer for 5 minutes. Reduce heat to low until barely simmering. Add chicken breasts; gently poach for 12 to 15 minutes or until just cooked through. Remove chicken from poaching liquid; discard liquid. Cool chicken completely and shred. 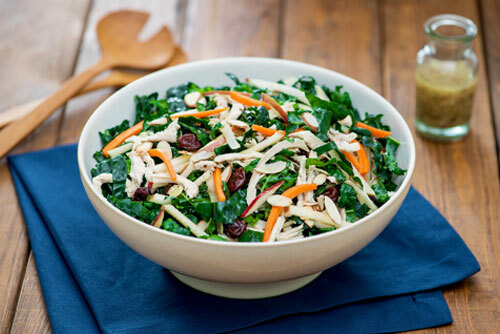 Add kale, carrot and apple to a large bowl. Toss with Honey-Mustard Dressing until coated. Stir in chicken, almonds and dried cranberries. Whisk olive oil with apple cider vinegar, honey, mustard, shallot, chives, salt and pepper. For a subtle spice, add a pinch of cayenne to the dressing. If you can’t find Tuscan kale, use regular kale. Tuscan kale is sweeter and more tender than regular kale.